This one-trick pony is slowly being rendered obselete by easier-to-use stoves. Once cream of the crop when boiling water in harsh climates, the MSR Reactor was crafted to provide quality performance in all conditions, for one to three people. It lacks the ability to simmer and it functions poorly on low. The MSR Windburner may be rendering it obsolete as it has taken the best features of the Reactor and some from the Jetboil stoves and rolled them up into one. The Reactor is a great tool for boiling water very fast and will stand up to all kinds of weather. 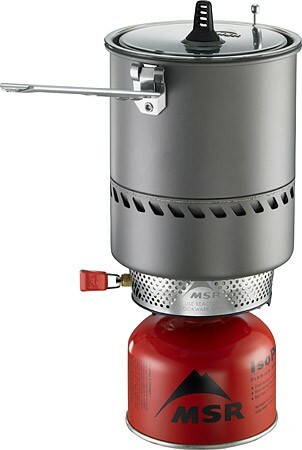 However, it lacks some of the conveniences of the other integrated canister stoves. The Reactor is a leader in its class in boil time and foul weather performance. In other categories, it's lacking. If you are a backpacker who likes to cook the occasional meal, this is not the stove for you. We had some concerns with a malfunction while testing this stove, and believe its brother the Windburner provides more bang for the buck ($150 for the Windburner versus the Reactor's $200+ price tag). Glen in an open bivy in the High Sierra, getting his morning brew ready on the MSR Reactor. We experienced a malfunction while testing the Reactor. While we were doing our boil tests, the burner would not light properly and the flame seemed to sit on top of the metal grate and remain a blue wispy flame, not the red hot one we are used to. After contacting customer service at MSR, it was determined that this was indeed a malfunction. It should have been jumping down to the metallic foam burner itself instead of sitting on top. One potential issue is that we were testing in a garage with very little air movement. MSR told us they have experienced this problem while doing lab tests indoors with no air movement, so they advised us to cook outdoors. They also told us it is preferable to light the Reactor with a strike ignitor type lighter so that the sparks land directly on the metallic foam burner. If you use a lighter (or a match), make sure to light the stove at the edge above the MSR logo on either side of the burner. There is a small opening in the top dome where the screen has been stretched to help the flame reach the burner surface. We have read other reviews online of those who have experienced this problem. That being said, our testers have used other Reactor models and have never had problems before. MSR did give us a quick fix to this particular problem that you can use if this happens to you while you're in the backcountry. If you see a blue flame after lighting the stove, you can briefly place a finger or thumb just in front of the air intakes on either side of the control valve. This essentially acts as a choke (like on a carburetor) to reduce the air intake and richen the fuel mixture. It will make the flame jump down to the metal foam and turn red very quickly. Be careful doing this if the stove is warm as the solid ring around the top of the stove could be very hot. We tried this on our malfunctioning burner and it worked! Our MSR Reactor malfunctioned, and the wispy blue flame shown here would not "jump down" to the metallic foam burner below. We contacted MSR's customer service to troubleshoot this problem. A Thermal Trip Mechanism shuts the stove down if it overheats to prevent a nasty canister explosion. This is not a common occurrence, but once the Reactor's Thermal Trip Mechanism is deployed, the stove is simply rendered inoperable — leaving you without a functioning stove. The Reactor is in the middle of the pack for fuel efficiency when there's no wind. It was the most fuel hogging integrated canister stove but still outperformed the small canister and liquid fuel stoves. It's in our 8 - 10 mph wind test that this stove really shone. In front of the fan, it was tied for the most fuel efficient with the Windburner, while every other stove used more fuel to bring water to a rolling boil. After it was lit but before we had time to put the pot on, this burner blew out occasionally. This was the only time we lost the flame. You can usually prevent it by shielding the burner with the pot or a windscreen, but it's cumbersome. Fuel spent in the lighting process definitely detracts from efficiency. THE MSR Reactor heat exchanger. This is a more durable design than the Jetboil Flux Ring heat exchanger. For a stove that we like to bring on fast and light alpine missions, the Reactor is not as lightweight as we would prefer. With a 1L pot it weighs in at 14.5 oz, 2.4oz heavier than the Jetboil MiniMo. It's still slightly lighter than the Windburner and if you consider the integrated canister stove as a pot, stove, and bowl all in one, it may save some weight compared to a liquid fuel stove like the MSR Whisperlite. As with all the integrated canister stoves we tested, the Reactor is not as versatile as we would like. While it may be a champion at boiling water, it will not slowly reduce your pasta sauce, fry up an omelet, or cook rice. In fact, this stove simply does not simmer and it is relatively poor at running on low. During our attempts to simmer delicate cuisine, we extinguished the burner dozens of times. If simmering if something you do often during your cooking adventures in the backcountry, consider the MSR PocketRocket 2 or Primus Classic Trail, as both excelled in this metric. This is the Reactor's strong suit; its red hot burner boils water fast. In our no-wind tests at 7980 feet, the Reactor brought 1 liter of water to a rolling boil in 3 minutes and 56 seconds. While it was malfunctioning and we only managed to get a blue flame out of it, it still worked eventually, boiling a half liter in 3 minutes and 54 seconds. In our 8 - 10 mph wind test the Reactor continued to dominate, boiling its liter in under 5 minutes. Getting ready to go test the Windburner and the Reactor back to back in cold condiions - don't forget the Ramen! The Reactor's burner has several unique features that make it faster than all the rest: (1) It is the widest of all stoves tested (roughly 3.5 inches in diameter). (2) It's surrounded by perforated metal which acts as a windscreen and captures air for the burner. (3) Unlike most stoves which only use convective heat, the Reactor's burner incorporates metallic foam that also dispatches radiant heat. The MSR Reactor in the alpine with the morning Alpenglow, where it belongs. This stove is shorter and squatter than the Jetboil Flash, making it more stable. It is also less tippy than the tall Windburner. Even when filled completely and held at full extension for pouring, the Reactor's handle hinge showed no sign of flex. To our pleasant surprise, the Reactor's handle also makes for an excellent bottle opener. The pouring spout built into the pot meant that we spilled less than every other integrated canister stove. As mentioned previously, unlike Jetboil models or the Windburner, the Reactor does not attach to the burner. Although it is easier to remove the pot from the heat source when it is about to boil over, in general, we prefer the burners that couple securely with the pot and think this is a big weakness for the Reactor. Trish McGuire using the MSR Reactor and the Melitta Ready Set Joe to brew coffee while camping at Charlotte Dome. We were disappointed to see that the Reactor's burner does not fit neatly into the 1L pot. It fits awkwardly into the pot, and most of the times that our testers were able to pack the burner and a 4 oz fuel can in the pot it all fell apart. This is in spite of the fact that the burner has a frustratingly small control knob, second in our test only to the one on the Primus Trail Classic. Unlike many liquid fuel stoves, which roar like jet engines and turn dinner into a shouting match, the Reactor is wholly tranquil. Based on our observations, it is possibly the quietest stove on the market today. The only problem with this is that the Reactor is so quiet, we have to lift the pot up or take off our gloves and put our hands by the vents to make sure it is on occasionally and not just wasting gas. If you're anticipating being outside when the weather gets bad, the Reactor is a great choice to bring along. It can handle itself at high winds and cold temperatures. It is a great snow melter. Alpine climbing, mountaineering, and backcountry ski trips are all great applications for the Reactor, especially if you want to boil water for more than 2 people with the 1.7 or 2.5L pots. The Reactor and the Jannu at 11,800ft. 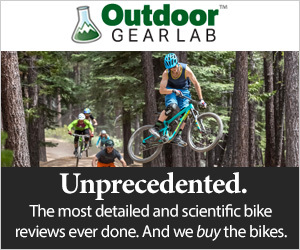 The Reactor is expensive and retails for $200 for the one-liter model. If you're after something bigger, you have the option of purchasing the 1.7-liter version for $240. The Windburner is a much better value and has better features if your stove absolutely must be able to operate in the wind. For all the other backpackers, there's the lighter MSR PocketRocket 2, our Editors' Choice winner, or the highly scoring Jetboil MiniMo. The Reactor is near and dear to our hearts, and at one time was the only windproof stove. Now other stoves on the market are close enough in some ways and so much better in others that it's hard to justify bringing the Reactor out for its one trick, boiling water in the wind.